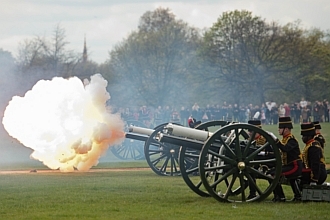 The Royal Navy has fired a 21-gun salute to mark Queen Elizabeth II's 86th birthday. The queen is traditionally given gun salutes on her birthday at military bases around the country. Saturday's main gun salute was fired at Portsmouth Harbour on the south coast of England. The queen celebrates her birthday twice, with smaller family celebrations on her actual birthday and a second, grander celebration at London's Buckingham Palace on her "official" birthday, which falls this year on June 16. This year the queen will also celebrate her Diamond Jubilee to mark 60 years on the throne on the weekend of June 2-5. We are following Project Britain in class to learn some more information about the Queen. As you can see, it's all about shooting! Can't they live without shooting? 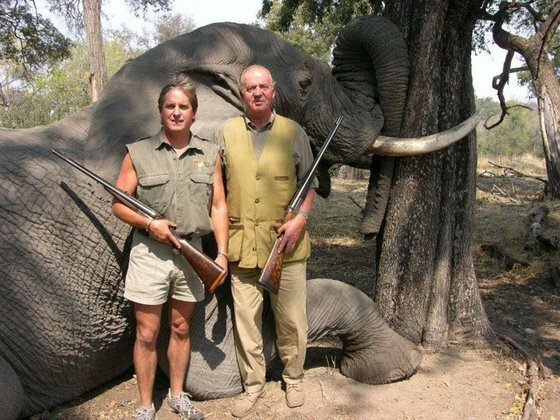 It doesn't seem so, as the Spanish monarch, also loves shooting, specially endangered species, such as the African elephant. Sorry for the picture, poor elephant! What's more this man if the President of Honour of WWF (World Wildlife Fund). Shame on you!